Objective To determine the efficacy of low intensity pulsed ultrasound (LIPUS) for healing of fracture or osteotomy. Data sources Medline, Embase, CINAHL, Cochrane Central Register of Controlled Trials, and trial registries up to November 2016. Study selection Randomized controlled trials of LIPUS compared with sham device or no device in patients with any kind of fracture or osteotomy. Review methods Two independent reviewers identified studies, extracted data, and assessed risk of bias. A parallel guideline committee (BMJ Rapid Recommendation) provided input on the design and interpretation of the systematic review, including selection of outcomes important to patients. The GRADE system was used to assess the quality of evidence. Results 26 randomized controlled trials with a median sample size of 30 (range 8-501) were included. The most trustworthy evidence came from four trials at low risk of bias that included patients with tibia or clavicle fractures. Compared with control, LIPUS did not reduce time to return to work (percentage difference: 2.7% later with LIPUS, 95% confidence interval 7.7% earlier to 14.3% later; moderate certainty) or the number of subsequent operations (risk ratio 0.80, 95% confidence interval 0.55 to 1.16; moderate certainty). For pain, days to weight bearing, and radiographic healing, effects varied substantially among studies. For all three outcomes, trials at low risk of bias failed to show a benefit with LIPUS, while trials at high risk of bias suggested a benefit (interaction P<0.001). When only trials at low risk of bias trials were considered, LIPUS did not reduce days to weight bearing (4.8% later, 4.0% earlier to 14.4% later; high certainty), pain at four to six weeks (mean difference on 0-100 visual analogue scale: 0.93 lower, 2.51 lower to 0.64 higher; high certainty), and days to radiographic healing (1.7% earlier, 11.2% earlier to 8.8% later; moderate certainty). Conclusions Based on moderate to high quality evidence from studies in patients with fresh fracture, LIPUS does not improve outcomes important to patients and probably has no effect on radiographic bone healing. The applicability to other types of fracture or osteotomy is open to debate. Within the past seven years, 10 systematic reviews have assessed the effectiveness of LIPUS for bone healing.5 6 7 8 9 10 11 12 13 14 Because existing randomized controlled trials were limited by small sample size, risk of bias, inconsistent results, and failure to cover outcomes important to patients, no review offered definitive conclusions. All reviews identified the need for additional randomized controlled trials. In addition, recent reviews used suboptimal strategies for outcome selection, data synthesis, analysis, and interpretation, leading to potentially misleading conclusions. For instance, the most recent systematic review,11 published in the top specialty journal for orthopedic surgeons, considered radiographic union a “critically important outcome” and did not assess the effect of LIPUS on the outcomes of pain relief or re-operation, which are important to patients. Their conclusion that “LIPUS treatment effectively reduces the time to radiographic fracture union” is questionable because it is based on the pooled absolute difference in days to healing, which does not account for the large variation in healing time, showed high unexplained heterogeneity (I2=94%), and was driven by studies at high risk of bias. This positive conclusion has the potential to expand the already considerable use of a potentially ineffective treatment. This systematic review is part of the BMJ Rapid Recommendations project, a collaborative effort from the MAGIC research and innovation program (www.magicproject.org) and BMJ. The aim of the project is to respond to new potentially practice changing evidence and provide a trustworthy practice guideline in a timely manner.15 In this case, the publication of the TRUST trial,16 a multicentre trial that randomized 501 patients with tibia fractures and has cast doubt on the effectiveness of LIPUS, initiated the process. This systematic review informed a parallel guideline published in a multi-layered electronic format on bmj.com17 and MAGICapp (https://www.magicapp.org/public/guideline/mL6yYj). We assessed whether LIPUS, compared with sham device or no device, improved outcomes important to patients and radiographic healing in those with any kind of fracture or osteotomy. According to the BMJ Rapid Recommendations process,15 a guideline panel provided critical oversight to the review and identified populations, subgroups, and outcomes of interest. The panel included six content experts (five orthopedic or trauma surgeons and one physiotherapist), six methodologists (four of whom are also front line clinicians), and four patients with personal experience of fractures (one of whom had used LIPUS). All patients received personal training and support to optimize contributions throughout the guideline development process. The members of the patient panel led the interpretation of the results based on what they expected the typical values and preferences of patients to be, as well as the variation between patients. We searched Medline, PubMed, Embase, CINAHL, and the Cochrane Central Register of Controlled Trials up to 16 November 2016, using a combination of keywords and MeSH terms for fracture, orthopedic surgical procedures, and ultrasound. Additional searches included trials registries clinicaltrials.gov and isrctn.com. An experienced research librarian designed the search strategies (appendix 1). Two independent reviewers scanned the references from eligible studies, related systematic reviews, and all studies citing eligible randomized controlled trials on Google Scholar. We included randomized controlled trials that compared LIPUS with a sham device or no device in patients with any type of fracture regardless of location (long bone or other bone), type (fresh fracture, delayed union, non-union, or stress fracture), or clinical management (operative or non-operative). We included any type of osteotomy, including distraction osteogenesis. We excluded trials published only as protocols or abstracts if we were unable to get the final results from investigators. Two reviewers, independently and in duplicate, screened the titles and abstracts of identified articles and acquired the full text of any article that either reviewer judged to be potentially eligible. They independently applied the eligibility criteria to the full texts and, when consensus could not be reached, resolved disagreements through discussion or adjudication by a third reviewer. Two reviewers used standardized forms to independently abstract data; they resolved disagreements by discussion or involved a third reviewer when required. Extracted data included characteristics of patients and fractures, clinical management, risk of bias, intervention details, statements about compliance with treatment, and outcomes. Two reviewers independently assessed risk of bias using a modified Cochrane risk of bias instrument that includes response options of “definitely or probably yes” (assigned a low risk of bias) or “definitely or probably no” (assigned a high risk of bias), an approach we have previously validated.18 On the study level, we assessed generation of randomization sequence, concealment of allocation, blinding of patients, caregivers, and outcome reporting (by comparing each publication with its corresponding published protocol, when available). For each outcome within studies, we assessed blinding of outcome assessors, loss to follow-up, and additional limitations. We considered ≥20% loss to follow-up to represent a high risk of bias, unless the investigators performed appropriate sensitivity analyses showing the robustness of the results. We categorized a trial as being at low risk of bias for a particular outcome if we identified no limitation for any risk of bias item. As a post hoc sensitivity analysis, we alternatively considered a more conservative threshold of ≥10% loss to follow-up because the categorization of three trials depended on this criterion (19%,16 28%,19 and 31%20 loss to follow-up for the outcome radiographic healing). Patients identified functional recovery (time to return to work and time to full weight bearing), pain reduction, and number of operations for subsequent fracture or related to osteotomy (re-operation for operatively managed fracture and osteotomy) as the most important outcomes for patients considering LIPUS for bone healing. Because many clinicians currently base their management on time to radiographic healing, a surrogate outcome important only insofar as it influences patient experience, the panel requested its inclusion in our review. We extracted all outcomes that fell into these categories as well as adverse effects related to the ultrasound device. 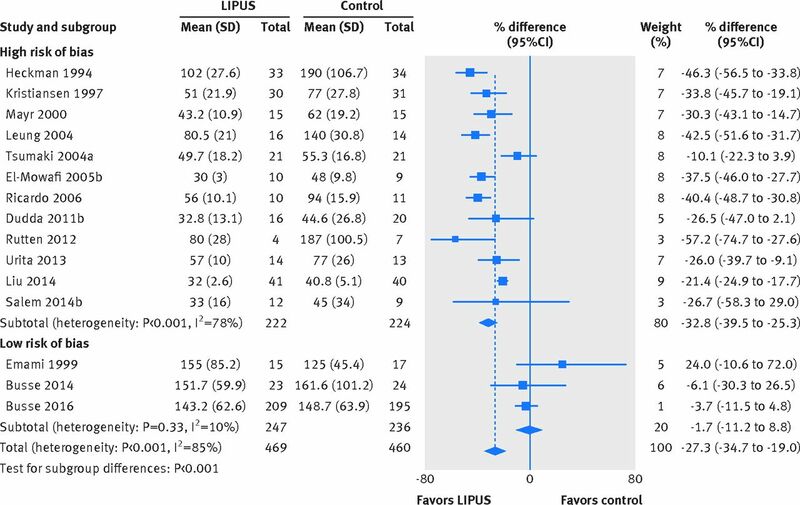 We pooled treatment effects of LIPUS on similar outcomes across eligible trials, regardless of clinical subgroups, focusing on complete case analysis. We calculated pooled estimates and associated 95% confidence intervals using random effects models for meta-analysis with three or more studies and fixed effects models for meta-analysis with two studies. We examined heterogeneity associated with all pooled analyses using both the χ2 test and I2 statistic. SAS version 9.4, R version 3.1, and Review Manager 5.3 provided software for the statistical analysis. For time to event outcomes, we pooled hazard ratios. For studies that did not apply methods of survival analysis, we considered time to event reported as a continuous variable (for example, days to return to work) at the longest follow-up time. We used the relative effect measure ratio of means (mean LIPUS/mean control) to account for the baseline difference in fracture healing depending on type of bone and (such as scaphoid, clavicle, tibia, etc) and fracture or procedure (such as stress fracture or distraction osteogenesis). We pooled the natural logarithm of the ratio of means and presented the results as percentage difference (relative change). For studies that reported the proportion of patients who achieved the event at a specific time point, we calculated risk ratios. For the outcomes number of subsequent operations and adverse events related to the device, we calculated both risk ratios, which are preferable in case of varying baseline risks, and risk differences, which allow inclusion of studies with zero events in both groups. In consultation with the expert and patient guideline panel, we prespecified three subgroup hypotheses to explain heterogeneity of effects between studies: LIPUS will show larger effects in studies at high risk of bias; effects will differ based on clinical subgroups; and LIPUS will show larger in studies effects with greater patient compliance. In consultation with the six clinical experts on the parallel guideline panel, we classified eligible randomized controlled trials according to the following five clinical subgroups: operatively managed fresh fractures, non-operatively managed fresh fractures, stress fractures, non-union, and osteotomy (including distraction osteogenesis). Because compliance was inconsistently reported, two reviewers independently categorized trials using response options of “definitely or probably high compliance” or “definitely or probably moderate compliance,” using as a guide a definition of high compliance as at least 80% of patients who applied LIPUS for at least 80% of the total time prescribed. We conducted univariable tests of interaction to establish if the effect size from the subgroups differed significantly from each other and, to test independence of subgroup effects, performed multivariable meta-regression in which we included risk of bias (high versus low), compliance with LIPUS treatment (high versus moderate), and clinical subgroups (as above) as independent variables in a single model. Only one outcome, days to radiographic healing, included enough studies to perform all planned subgroup analysis. We had prespecified in our protocol at least three studies per group. We assessed the credibility of significant subgroup effects using the criteria suggested by Sun and colleagues.22 Based on the finding that risk of bias seemed to independently explain the high heterogeneity in the outcome days to radiographic healing, we performed subgroup analysis by risk of bias for all outcomes. To calculate absolute effects, we applied the effect estimate from the meta-analysis to the control arm of the TRUST trial, which enrolled patients with tibia fractures and had the largest sample size of any eligible study that was at low risk of bias. The approach to rating certainty of individual outcomes was fully contextualized—that is, in rating quality about any individual outcome, we took into account the findings on the other outcomes. Four patient representatives were full members of the guideline and contributed to the selection and prioritization of outcomes, values and preferences assessments, and critical feedback to the protocol for the systematic review and the BMJ Rapid Recommendations manuscript. We identified 3849 potentially eligible abstracts, retrieved 42 studies in full text, and found 26 eligible randomized controlled trials (fig 1⇓).16 19 20 26 27 28 29 30 31 32 33 34 35 36 37 38 39 40 41 42 43 44 45 46 47 48 49 50 Two trials, Handolin and colleagues32 33 and Emami and colleagues,29 30 provided two publications reporting on the same group of patients. There were no shared patients between the TRUST pilot26 and the definitive trial.16 Our registry search yielded four protocols of potentially eligible trials; one was discontinued because of slow recruitment (ISRCTN90844675, personal communication, outcome data not available yet), one manuscript is under peer review (NCT00744861, personal communication: “no difference between the control group and the ultrasound group”), one is completed but unpublished (JPRN-UMIN000002005, no response from investigators), and the last is still ongoing (NCT02383160). Attempts to acquire the full text of another potentially eligible study,51 reported in a recent systematic review,11 were unsuccessful. We contacted authors to resolve areas of uncertainty and successfully clarified details in five randomized controlled trials.32 33 35 37 40 We considered six trials to be at low risk of bias,16 26 29 37 46 47 and the remaining 20 studies to be at high risk of bias (table 2⇓). The main limitations were failure to report method for allocation concealment (15 trials), unblinded patients (10 trials), unblinded caregivers or outcome assessors (10 trials), and high or unclear numbers of patients excluded from the analysis (13 trials; table 2⇓). Table 3⇓ summarizes findings of all outcomes. Interactive tables summarizing findings are available online at https://www.magicapp.org/public/guideline/mL6yYj. Only the TRUST trial assessed time to full weight bearing with a time to event analysis and found no significant effect (hazard ratio 0.87 favoring LIPUS, 95% confidence interval 0.70 to 1.08; 451 patients). Three trials assessed the number of days to full weight bearing. Overall results suggested no significant effect on full weight bearing with LIPUS but high heterogeneity (I2=95%). The effect of the one trial at high risk of bias (40.0% earlier, 48.4% to 30.3 earlier)35 differed significantly from the consistent results from the two trials at low risk of bias (4.8% later, 4.0% earlier to 14.4% later; 483 patients; interaction P<0.001, subgroup effect not effected by alternative threshold for missing data) (fig 3⇓). Appendix 2 presents results of other functional outcomes including return to leisure activities, return to household activities, return to level of function before injury, and physical function measured with a multidimensional questionnaire. None of these was significantly affected by use of LIPUS, nor did they show substantial inconsistency. Other outcomes for pain included pain intensity assessed at multiple time points and number of painful days (appendix 4). None showed a significant effect of LIPUS nor substantial inconsistency. Ten trials reported the number of subsequent operations, including three trials reporting zero events in both arms. Neither the pooled risk ratio (0.80 in favor of LIPUS, 95% confidence interval 0.55 to 1.16; I2=0%; seven trials, 693 patients; fig 5⇓) nor the pooled risk difference (3% reduction with LIPUS, 7% reduction to 2% increase; I2=0%; 10 trials, 740 patients) showed a significant effect. There was no significant interaction with risk of bias on either scale (risk ratio: P=0.75; risk difference: P=0.64). The results did not depend on the threshold for missing data. Two trials used time to event analysis methods to assess time to radiographic healing16 26 and showed no significant effect of LIPUS (hazard ratio 1.06 in favor of control, 95% confidence interval 0.86 to 1.32; I2=0%; 532 patients). Fifteen trials reported the number of days to radiographic healing. Overall results suggested accelerated radiographic healing with LIPUS (26% earlier, 33.6% to 17.8% earlier; I2=85%). The effect differed significantly between the 12 trials at high risk of bias (32.8% earlier, 39.5% to 25.3% days earlier; I2=78%; 446 patients) and the three trials at low risk of bias (1.7% earlier, 11.2% earlier to 8.8% later, I2=10%; 483 patients; interaction P<0.001; fig 6⇓). This subgroup effect fulfilled eight of nine credibility criteria relevant to risk of bias as an explanation of heterogeneity (table 4⇓). In addition, the subgroup effect was robust to our sensitivity analysis using a more conservative threshold for defining risk of attrition bias (interaction P=0.004, fig B in appendix 3). The effect of LIPUS on days to radiographic healing did not differ significantly across clinical subgroups (interaction P=0.13, fig C in appendix 3) or between high and moderate compliance with treatment (interaction P=0.99, fig D in appendix 3). In our multivariable meta-regression, which included risk of bias, clinical subgroups, and compliance with treatment, the only significant effect modifier was the risk of bias (P=0.005). The funnel plot based on time to radiographic healing was not clearly asymmetrical, and Egger’s test for publication bias was not significant (P=0.25, fig E in appendix 3). Seven studies explicitly reported the absence of any adverse effects related to the device; two other studies reported mild transient skin irritations in six patients. The pooled risk ratio based on these two studies (2.65 in favor of control, 95% confidence interval 0.32 to 22.21; 129 patients) was not significant, nor was the pooled risk difference based on all nine trials (0%, 1% reduction to 1% increase; I2=0%; 839 patients; fig 7⇓). We found no significant interaction with risk of bias on the risk difference scale (P=0.75). Our systematic review provides moderate quality evidence that LIPUS applied to patients with fractures or osteotomies has no effect on time to return to work or the number of subsequent operations (table 3⇑). Overall results suggested a possible reduction of days to full weight bearing, pain, and radiographic healing, but with large variability between studies strongly associated with risk of bias as an effect modifier: only trials with high risk of bias showed benefit. Based on randomized controlled trials at low risk of bias, we found high quality evidence that LIPUS has no effect on pain reduction, days to full weight bearing, or adverse effects related to the device, and moderate quality evidence that LIPUS has no effect on days to radiographic healing (table 3⇑). The primary limitation of our review is the failure of most trials to measure or report outcomes important to patients. Of the 26 eligible trials, 11 reported, in sufficient detail for inclusion in meta-analysis, outcomes that patients consider critical for decision making.16 26 27 29 31 32 33 35 37 39 46 47 Of these, the only four trials that contributed substantial data included either patients with operatively managed fresh tibia fracture16 26 29 or conservatively managed clavicle fracture.37 One could question the extent to which our results apply to patients not included at all (such as children) or under-represented (stress fractures, non-union, and osteotomies) in the eligible trials. Qualitative subgroup effects (such as no benefit in one subgroup and important benefit in another) are, however, unusual. In the absence of evidence to the contrary, it might therefore be reasonable to apply our results to these populations. Our subgroup analysis and meta-regression for radiographic healing found no effect modification based on clinical subgroups. Certainly, the burden of proof regarding the effect of LIPUS in children and under-represented populations rests with those who might postulate a benefit. Our findings are similar to those of a 2016 systematic review of 15 small trials that explored electrical stimulation versus sham treatment for fracture healing, only four of which were at low risk of bias.52 This review found moderate quality evidence for a 35% reduction (95% confidence interval 19% to 47%; I2=46%) in the rate of radiographic non-union. The authors found no evidence of a subgroup effect based on clinical presentation (that is, fresh fractures, delayed union or non-union, spinal fusion, or surgical osteotomy; interaction P=0.41). They did not explore whether risk of bias explained heterogeneity, but all four trials at low risk of bias showed no significant effect on radiographic union.53 54 55 56 They found a small reduction in pain (mean difference of −7.7 mm on a 100 mm visual analogue scale for pain, −13.92 to −1.43) and low quality evidence for no difference in functional outcome (mean difference of −0.88 points on 100 point SF-36 physical component summary score, −6.63 to 4.87). In conclusion, moderate to high quality evidence shows that LIPUS fails to accelerate return to work, return to full weight bearing, and pain reduction or reduce the need for subsequent operation. If one gives highest credibility to combined effects from all available randomized controlled trials, low quality evidence would suggest a large reduction in time to radiographic healing. If, however, one gives higher credence to trials at low risk of bias, moderate to high quality evidence suggests that LIPUS not only has no effect on outcomes important to patients but also fails to accelerate radiographic healing. The evidence applies directly to patients with fresh fractures. The applicability to children and other under-represented populations, particularly those with non-union, for which no trustworthy direct evidence exists, is open to debate. We thank members of the Rapid Recommendations panel for critical feedback on outcome and subgroup selection, GRADE judgments, and manuscript feedback, including Rudolf Poolman (chair and orthopedic surgeon), Ian Harris (orthopedic and trauma surgeon), Inger Schipper (trauma surgeon), Maureen Smith (patient representative), Alexandra Albin (patient representative), Sally Nador (patient representative), William Sasges (patient representative), Ton Kuijpers (methodologist), Loes van Beers (physiotherapist), and Michael Verhofstad (trauma surgeon). Contributors: JWB, RACS, GHG, and POV conceived the study idea. SS and JWB coordinated the systematic review. SS wrote the first draft of the manuscript. RC designed the search strategy. LL, AK, RC, and SS screened abstracts and full texts. LL, AK, RACS, TA, and SS acquired the data and judged risk of bias in the studies. SS, JWB, and DHA performed the data analysis. DHA and GHG provided statistical advice. SS, RACS, BM, POV, JWB, and GHG interpreted the data analysis. All authors critically revised the manuscript. SS had full access to all of the data in the study and takes responsibility for the integrity of the data and the accuracy of the data analysis. SS is guarantor. Competing interest: All authors have completed the ICMJE uniform disclosure form at www.icmje.org/coi_disclosure.pdf and declare that JWB, DHA, and GHG were co-authors of the TRUST trial, which was supported in part by an industry grant from Smith & Nephew, a manufacturer of LIPUS devices. National Institute for Health and Care Excellence. Low-intensity pulsed ultrasound to promote fracture healing. 2010. https://www.nice.org.uk/guidance/ipg374/history. Food and Drug Administration. Approval order for Exogen device. 2000, http://www.fda.gov/ohrms/dockets/dailys/00/mar00/031300/aav0001.pdf. Busse JW, Morton E, Lacchetti C, Guyatt GH, Bhandari M. Current management of tibial shaft fractures: a survey of 450 Canadian orthopedic trauma surgeons. Acta Orthop2008;79:689-94. doi:10.1080/17453670810016722 pmid:18839377. Wachovia Capital Markets. Equity research: bone growth stimulation 2008 outlook. 2007. Griffin XL, Parsons N, Costa ML, Metcalfe D. Ultrasound and shockwave therapy for acute fractures in adults. Cochrane Database Syst Rev2014;(6):CD008579.pmid:24956457. Ebrahim S, Mollon B, Bance S, Busse JW, Bhandari M. Low-intensity pulsed ultrasonography versus electrical stimulation for fracture healing: a systematic review and network meta-analysis. Can J Surg2014;57:E105-18. doi:10.1503/cjs.010113 pmid:24869616. Bashardoust Tajali S, Houghton P, MacDermid JC, Grewal R. Effects of low-intensity pulsed ultrasound therapy on fracture healing: a systematic review and meta-analysis. Am J Phys Med Rehabil2012;91:349-67. doi:10.1097/PHM.0b013e31822419ba pmid:21904188. Hannemann PF, Mommers EH, Schots JP, Brink PR, Poeze M. The effects of low-intensity pulsed ultrasound and pulsed electromagnetic fields bone growth stimulation in acute fractures: a systematic review and meta-analysis of randomized controlled trials. Arch Orthop Trauma Surg2014;134:1093-106. doi:10.1007/s00402-014-2014-8 pmid:24895156. Martinez de Albornoz P, Khanna A, Longo UG, Forriol F, Maffulli N. The evidence of low-intensity pulsed ultrasound for in vitro, animal and human fracture healing. Br Med Bull2011;100:39-57. doi:10.1093/bmb/ldr006 pmid:21429948. 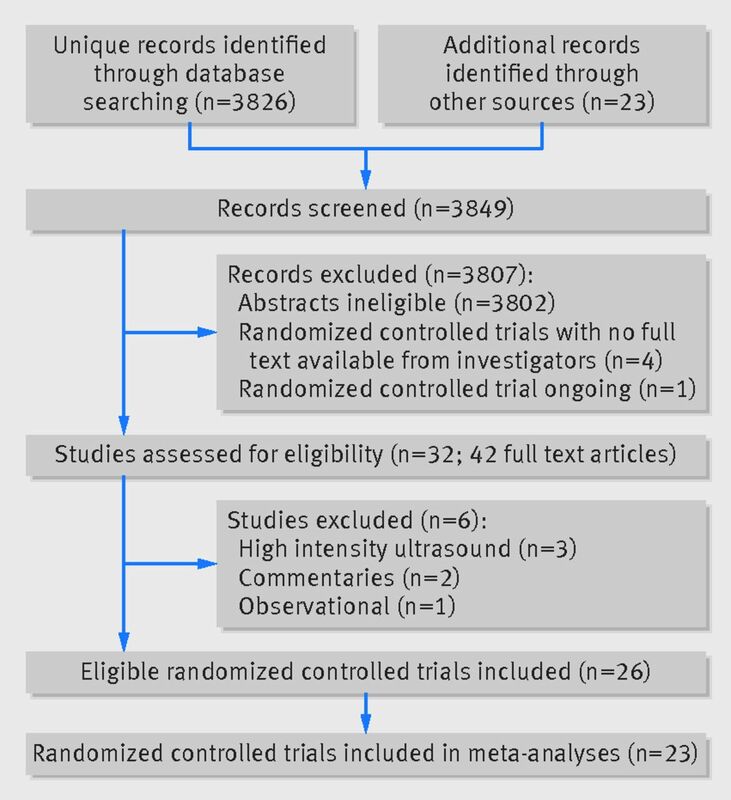 Raza H, Saltaji H, Kaur H, Flores-Mir C, El-Bialy T. Effect of Low-Intensity Pulsed Ultrasound on Distraction Osteogenesis Treatment Time: A Meta-analysis of Randomized Clinical Trials. J Ultrasound Med2016;35:349-58. doi:10.7863/ultra.15.02043 pmid:26782167. Rutten S, van den Bekerom MP, Sierevelt IN, Nolte PA. Enhancement of Bone-Healing by Low-Intensity Pulsed Ultrasound: A Systematic Review. JBJS Rev2016;4:01874474-201603000. doi:10.2106/JBJS.RVW.O.00027 pmid:27500435. Snyder BM, Conley J, Koval KJ. Does low-intensity pulsed ultrasound reduce time to fracture healing? A meta-analysis. Am J Orthop (Belle Mead NJ)2012;41:E12-9.pmid:22482096. Watanabe Y, Matsushita T, Bhandari M, Zdero R, Schemitsch EH. Ultrasound for fracture healing: current evidence. J Orthop Trauma2010;24(Suppl 1):S56-61. doi:10.1097/BOT.0b013e3181d2efaf pmid:20182238. Busse JW, Bhandari M, Einhorn TA, et al. TRUST Investigators writing group. Re-evaluation of low intensity pulsed ultrasound in treatment of tibial fractures (TRUST): randomized clinical trial. BMJ2016;355:i5351.pmid:27797787. Poolman RW, Agoritsas T, Siemieniuk RAC, et alLow intensity pulsed ultrasound (LIPUS) for bone healing: a clinical practice guideline. BMJ2017 (in press). Akl EA, Sun X, Busse JW, et al. Specific instructions for estimating unclearly reported blinding status in randomized trials were reliable and valid. J Clin Epidemiol2012;65:262-7. doi:10.1016/j.jclinepi.2011.04.015 pmid:22200346. Kristiansen TK, Ryaby JP, McCabe J, Frey JJ, Roe LR. Accelerated healing of distal radial fractures with the use of specific, low-intensity ultrasound. A multicenter, prospective, randomized, double-blind, placebo-controlled study. J Bone Joint Surg Am1997;79:961-73. doi:10.2106/00004623-199707000-00002 pmid:9234872. Heckman JD, Ryaby JP, McCabe J, Frey JJ, Kilcoyne RF. Acceleration of tibial fracture-healing by non-invasive, low-intensity pulsed ultrasound. J Bone Joint Surg Am1994;76:26-34. doi:10.2106/00004623-199401000-00004 pmid:8288661. Thorlund K, Walter SD, Johnston BC, Furukawa TA, Guyatt GH. Pooling health-related quality of life outcomes in meta-analysis-a tutorial and review of methods for enhancing interpretability. Res Synth Methods2011;2:188-203. doi:10.1002/jrsm.46 pmid:26061786. Guyatt GH, Oxman AD, Kunz R, et al. GRADE Working Group. GRADE guidelines: 7. Rating the quality of evidence--inconsistency. J Clin Epidemiol2011;64:1294-302. doi:10.1016/j.jclinepi.2011.03.017 pmid:21803546. Busse JW, Bhandari M, Einhorn TA, et al. Trial to re-evaluate ultrasound in the treatment of tibial fractures (TRUST): a multicenter randomized pilot study. Trials2014;15:206. doi:10.1186/1745-6215-15-206 pmid:24898987. Dudda M, Hauser J, Muhr G, Esenwein SA. Low-intensity pulsed ultrasound as a useful adjuvant during distraction osteogenesis: a prospective, randomized controlled trial. J Trauma2011;71:1376-80. doi:10.1097/TA.0b013e31821912b2 pmid:22071933. El-Mowafi H, Mohsen M. The effect of low-intensity pulsed ultrasound on callus maturation in tibial distraction osteogenesis. Int Orthop2005;29:121-4. doi:10.1007/s00264-004-0625-3 pmid:15685456. Emami A, Petrén-Mallmin M, Larsson S. No effect of low-intensity ultrasound on healing time of intramedullary fixed tibial fractures. J Orthop Trauma1999;13:252-7. doi:10.1097/00005131-199905000-00005 pmid:10342350. Emami A, Larsson A, Petrén-Mallmin M, Larsson S. Serum bone markers after intramedullary fixed tibial fractures. Clin Orthop Relat Res1999;(368):220-9.pmid:10613172. Gan TY, Kuah DE, Graham KS, Markson G. Low-intensity pulsed ultrasound in lower limb bone stress injuries: a randomized controlled trial. Clin J Sport Med2014;24:457-60. doi:10.1097/JSM.0000000000000084 pmid:24667169. Handolin L, Kiljunen V, Arnala I, et al. Effect of ultrasound therapy on bone healing of lateral malleolar fractures of the ankle joint fixed with bioabsorbable screws. J Orthop Sci2005;10:391-5. doi:10.1007/s00776-005-0901-0 pmid:16075172. Handolin L, Kiljunen V, Arnala I, Pajarinen J, Partio EK, Rokkanen P. The effect of low intensity ultrasound and bioabsorbable self-reinforced poly-L-lactide screw fixation on bone in lateral malleolar fractures. Arch Orthop Trauma Surg2005;125:317-21. doi:10.1007/s00402-005-0801-y pmid:15821899. Handolin L, Kiljunen V, Arnala I, et al. No long-term effects of ultrasound therapy on bioabsorbable screw-fixed lateral malleolar fracture. Scand J Surg2005;94:239-42. doi:10.1177/145749690509400312 pmid:16259175. Leung KS, Lee WS, Tsui HF, Liu PP, Cheung WH. Complex tibial fracture outcomes following treatment with low-intensity pulsed ultrasound. Ultrasound Med Biol2004;30:389-95. doi:10.1016/j.ultrasmedbio.2003.11.008 pmid:15063521. Liu Y, Wei X, Kuang Y, et al. Ultrasound treatment for accelerating fracture healing of the distal radius. A control study. Acta Cir Bras2014;29:765-70. doi:10.1590/S0102-86502014001800012 pmid:25424299. Lubbert PH, van der Rijt RH, Hoorntje LE, van der Werken C. Low-intensity pulsed ultrasound (LIPUS) in fresh clavicle fractures: a multi-centre double blind randomised controlled trial. Injury2008;39:1444-52. doi:10.1016/j.injury.2008.04.004 pmid:18656872. Mayr E, Rudzki MM, Rudzki M, Borchardt B, Hausser H, Ruter A. Does low intensity, pulsed ultrasound accelerate healing of scaphoid fractures?[German]. Handchir Mikrochir Plast Chir2000;32:115-22. doi:10.1055/s-2000-19253 pmid:10857066. Patel K, Kumar S, Kathiriya N, et al. An Evaluation of the Effect of Therapeutic Ultrasound on Healing of Mandibular Fracture. Craniomaxillofac Trauma Reconstr2015;8:299-306. doi:10.1055/s-0034-1544104 pmid:26576234. Ricardo M. The effect of ultrasound on the healing of muscle-pediculated bone graft in scaphoid non-union. Int Orthop2006;30:123-7. doi:10.1007/s00264-005-0034-2 pmid:16474939. Rutten S, Klein-Nulend J, Guit GL, et al. Use of low-intensity pulsed ultrasound stimulation of delayed unions of the osteotomized fibula: a prospective randomized double-blind trial (Thesis). Low-intensity pulsed ultrasound treatment in delayed bone healing [thesis]. Amsterdam: Vrije Universiteit Amsterdam; 2012. Rue JP, Armstrong DW 3rd, , Frassica FJ, Deafenbaugh M, Wilckens JH. The effect of pulsed ultrasound in the treatment of tibial stress fractures. Orthopedics2004;27:1192-5.pmid:15566133. Salem KH, Schmelz A. Low-intensity pulsed ultrasound shortens the treatment time in tibial distraction osteogenesis. Int Orthop2014;38:1477-82. doi:10.1007/s00264-013-2254-1 pmid:24390009. Schofer MD, Block JE, Aigner J, Schmelz A. Improved healing response in delayed unions of the tibia with low-intensity pulsed ultrasound: results of a randomized sham-controlled trial. BMC Musculoskelet Disord2010;11:229. doi:10.1186/1471-2474-11-229 pmid:20932272. Kamath JB, Jayasheelan N, Reddy B, Muhammed S, Savur A. The effect of low-intensity pulsed ultrasound therapy on fracture healing. Muller J Med Sci Res2015;6:49-53doi:10.4103/0975-9727.146426. Schortinghuis J, Bronckers AL, Stegenga B, Raghoebar GM, de Bont LG. Ultrasound to stimulate early bone formation in a distraction gap: a double blind randomised clinical pilot trial in the edentulous mandible. Arch Oral Biol2005;50:411-20. doi:10.1016/j.archoralbio.2004.09.005 pmid:15748694. Schortinghuis J, Bronckers AL, Gravendeel J, Stegenga B, Raghoebar GM. The effect of ultrasound on osteogenesis in the vertically distracted edentulous mandible: a double-blind trial. Int J Oral Maxillofac Surg2008;37:1014-21. doi:10.1016/j.ijom.2008.07.004 pmid:18757179. Tsumaki N, Kakiuchi M, Sasaki J, Ochi T, Yoshikawa H. Low-intensity pulsed ultrasound accelerates maturation of callus in patients treated with opening-wedge high tibial osteotomy by hemicallotasis. J Bone Joint Surg Am2004;86:2399-405. doi:10.2106/00004623-200411000-00006 pmid:15523009. Urita A, Iwasaki N, Kondo M, Nishio Y, Kamishima T, Minami A. Effect of low-intensity pulsed ultrasound on bone healing at osteotomy sites after forearm bone shortening. J Hand Surg Am2013;38:498-503. doi:10.1016/j.jhsa.2012.11.032 pmid:23375786. Zacherl M, Gruber G, Radl R, Rehak PH, Windhager R. No midterm benefit from low intensity pulsed ultrasound after chevron osteotomy for hallux valgus. Ultrasound Med Biol2009;35:1290-7. doi:10.1016/j.ultrasmedbio.2009.03.008 pmid:19540659. Nolte PA, Maas M, Roolker L, Marti RK, Albers GHR. Effect of low-intensity ultrasound on bone healing in osteotomies of the lower extremity: a randomised trial. In: Nolte PA, ed. Nonunions – surgery and low-intensity ultrasound treatment [thesis]. Amsterdam: Universiteit van Amsterdam; 2002:96-106. Aleem IS, Aleem I, Evaniew N, et al. Efficacy of Electrical Stimulators for Bone Healing: A Meta-Analysis of Randomized Sham-Controlled Trials. Sci Rep2016;6:31724. doi:10.1038/srep31724 pmid:27539550. Hannemann PF, Göttgens KW, van Wely BJ, et al. The clinical and radiological outcome of pulsed electromagnetic field treatment for acute scaphoid fractures: a randomised double-blind placebo-controlled multicentre trial. J Bone Joint Surg Br2012;94:1403-8. doi:10.1302/0301-620X.94B10.28844 pmid:23015569. Hannemann PF, van Wezenbeek MR, Kolkman KA, et al. CT scan-evaluated outcome of pulsed electromagnetic fields in the treatment of acute scaphoid fractures: a randomised, multicentre, double-blind, placebo-controlled trial. Bone Joint J2014;96-B:1070-6. doi:10.1302/0301-620X.96B8.33767 pmid:25086123. Mammi GI, Rocchi R, Cadossi R, Massari L, Traina GC. The electrical stimulation of tibial osteotomies. Double-blind study. Clin Orthop Relat Res1993;(288):246-53.pmid:8458140. Martinez-Rondanelli A, Martinez JP, Moncada ME, Manzi E, Pinedo CR, Cadavid H. Electromagnetic stimulation as coadjuvant in the healing of diaphyseal femoral fractures: a randomized controlled trial. Colomb Med (Cali)2014;45:67-71.pmid:25100891.